To celebrate the 10 year anniversary of our first deck building kit - and in an effort to keep up with trends in the skateboard industry - Roarockit has developed a new kit to help introduce riders to the board building process. This is our answer to the 'mini-cruiser' craze that has been hitting the streets around the world. Introducing... the Lil' Rockit Builder Kit. Mini-cruisers like the Penny Board and Z-Flex have been around for a long time, almost since the beginning of skateboarding itself. The smaller boards appeal to both advanced riders who want to try something new, and young kids who get their introduction to the sport riding something their own size. Either way, there is a nostalgia attached to the smaller boards and we want to give builders a chance to make their own. The Lil' Rockit Builder Kit comes with everything needed to make your own 7 Layer mini-board. The veneer, foam, Thin Air Press vacuum bag, tools and even the glue are all included in one box. 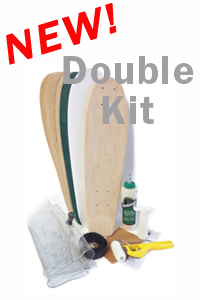 This is our most economical introduction to board building, and for the first time ever, we will also be including our Colour-Infused maple veneers with every set purchased! The preshaped veneers measure 23" long x 6.25" wide, and the foam mold features mild concave with a 5/8" kicktail. So not only will you be able to stuff this board into your locker or backpack, but you'll be able to brag about the fact that you built it yourself! Refill Kits are meant for builders who may already have a Thin Air Press vacuum bag, and just need certain materials to build one of our preshaped boards. Click on the products below for more information and pricing.